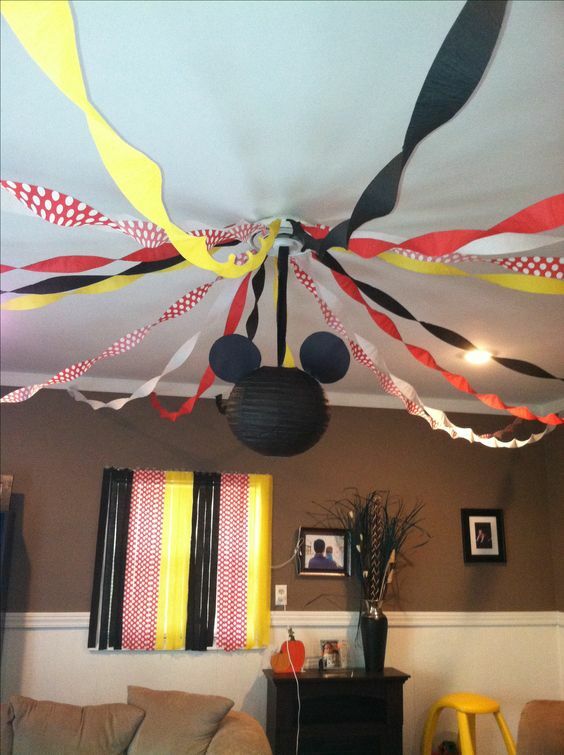 Throwing a Mickey Mouse birthday and need some awesome party ideas? You’ve definitely come to the right place! 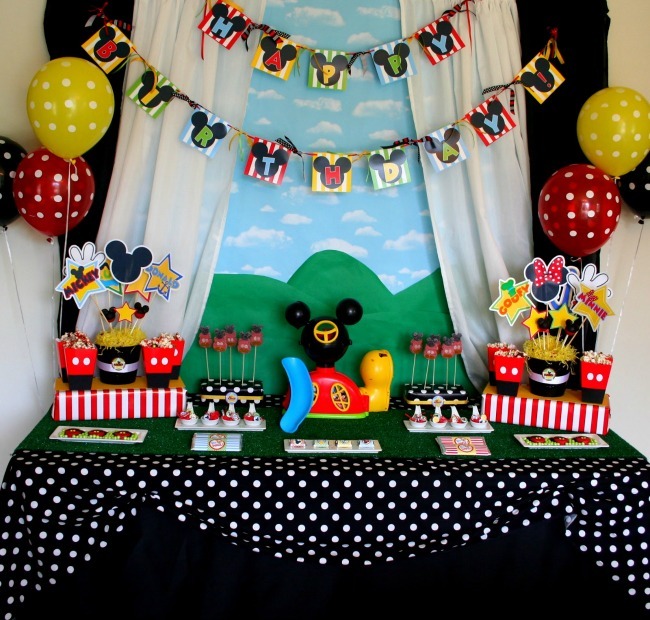 On the lookout for awesome Mickey Mouse party ideas? Mickey Mouse is the perfect theme for anyone who’s celebrating their birthday and at any age! 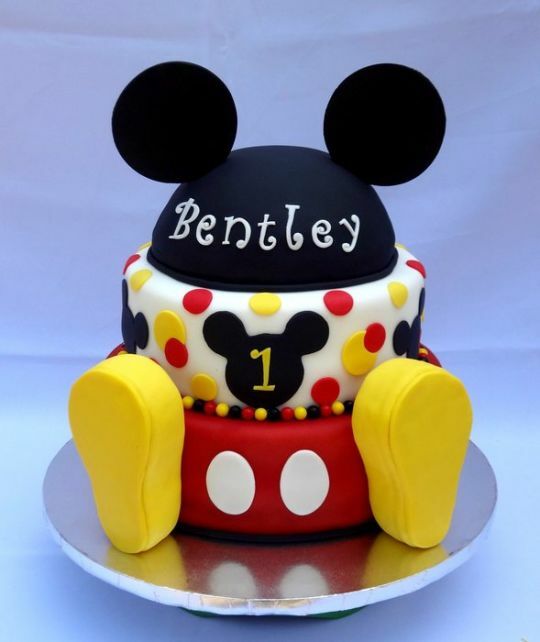 You can have an awesome Mickey Mouse 1st birthday, 5th birthday, or even 40th birthday! I mean, who doesn’t LOVE Mickey, right?! Mickey Mouse birthday parties have been a popular theme for more than 80 years as the most popular mouse in the world was born (or created by Walt Disney) in 1928. Mickey Mouse is the most popular character among Walt’s Disney’s cartoon character and continues to be the world’s most favorite mouse. Today, Mickey Mouse Clubhouse parties are a sure hit too. Who wouldn’t want to celebrate together with Mickey, Minnie, Daisy, Donald, Goofy, and the rest of the Mickey Mouse Clubhouse gang? If you’re planning a Mickey Mouse birthday, you’ve come to the right place. 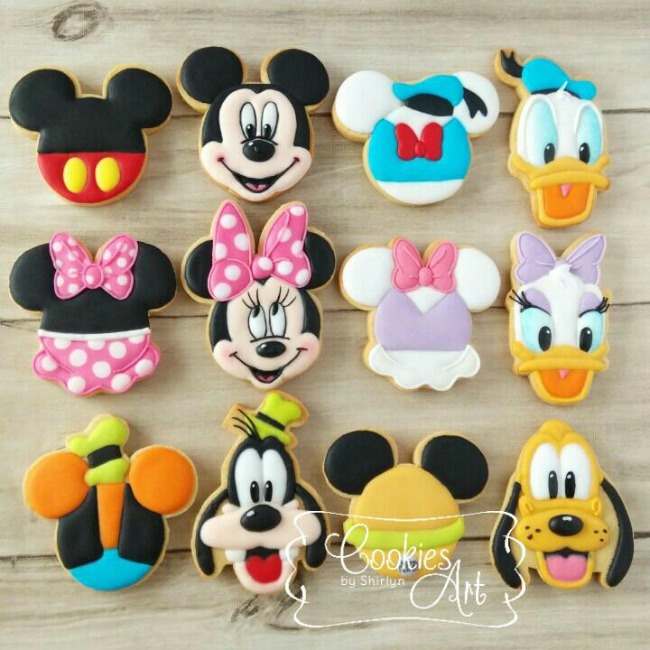 From Mickey Mouse party food ideas like cookies, cupcakes and cakes to party decorations (can’t do without those mouse ears!) to unique and creative table centerpieces, we’re sure to WOW you with these easy Mickey Mouse party ideas – guaranteed! We’ve rounded up the best 40+ Mickey Mouse Party Ideas that will give you and your guests Disney fever! On our list, we have tons and tons of creative, mind-blowing Mickey Mouse party ideas that will put your event above all the rest! 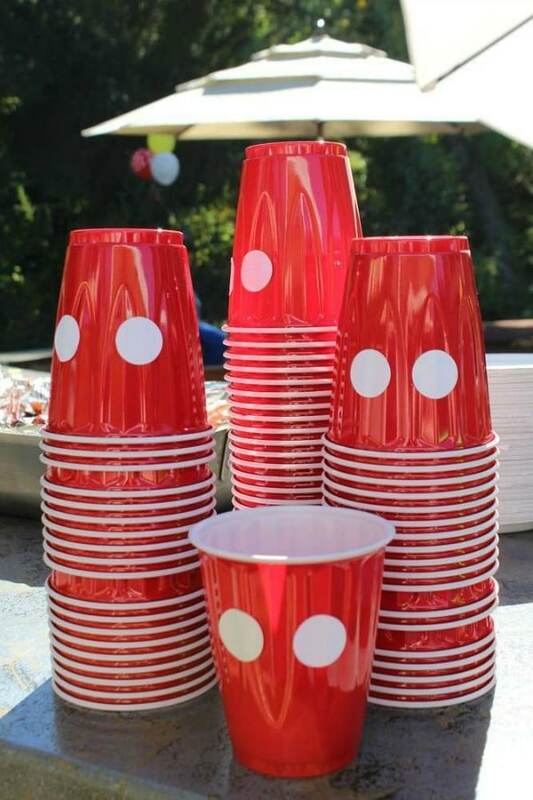 These DIY party cups are super easy to make for a fun Mickey Mouse Clubhouse Party. Just grab a circle puncher and some white paper. Stick them to your red party cups and you have a simple decor idea that makes a big impact. Guests will love your attention to details. The details of a party are what set it apart from all the others. Many clever and unique party DIY ideas are the most simple to accomplish. 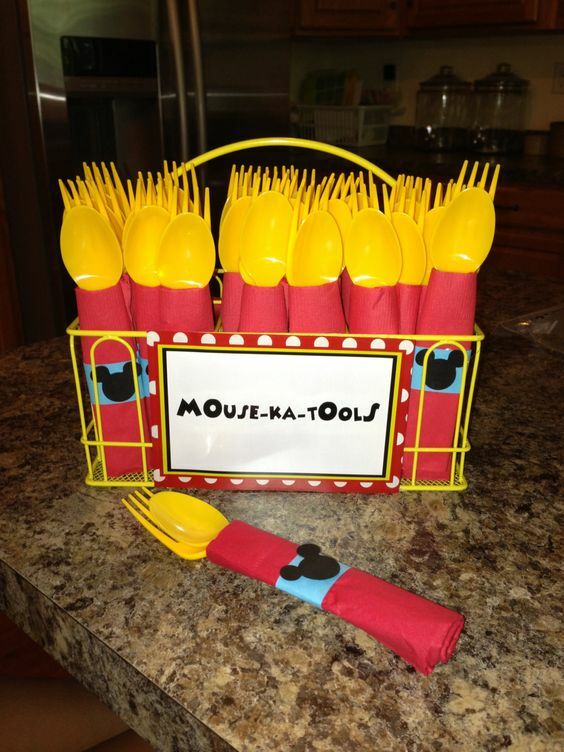 If you’re having a Mickey themed party, you have to have some Mouse-ka-tools! This Mouse-ka-Tools Mickey Mouse Utensil Idea is perfect and budget-friendly. All you have to do is wrap up some yellow utensils with red napkins and add some Mickey ears. Then grab this Mouse-ka-tools sign to add to your utensil basket. 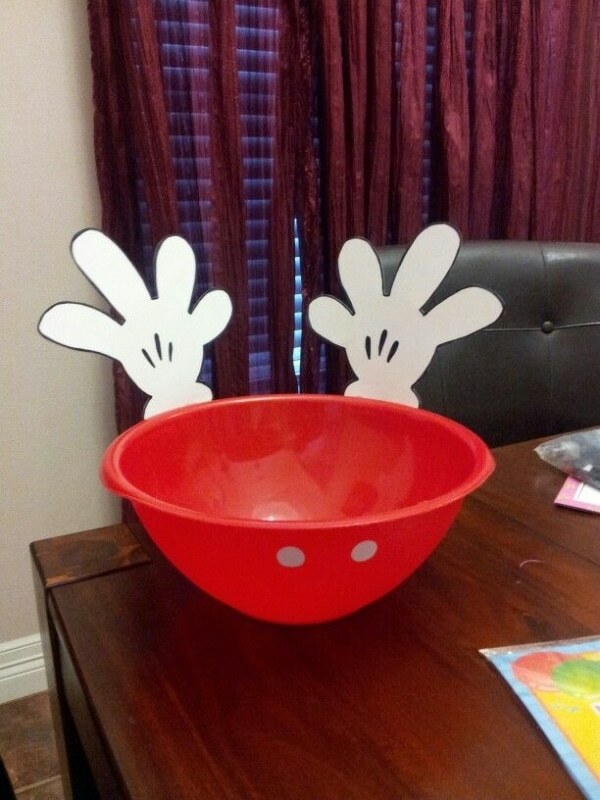 How adorable is this Mickey Mouse Chip Bowl Idea?! This is another super easy project that you can do for your party. Head to your local Dollar Tree and pick up a large red bowl. Download the free Mickey Mouse hands template and print out on white cardstock paper. Cut the hands out along with two circles and attach them to the bowl. Everyone will love this simple yet creative idea! This Mickey Mouse Fruit Tray is sure to be a hit with both kids and adults! Plus it’s always a good idea to add some delicious fruit to your party spread. 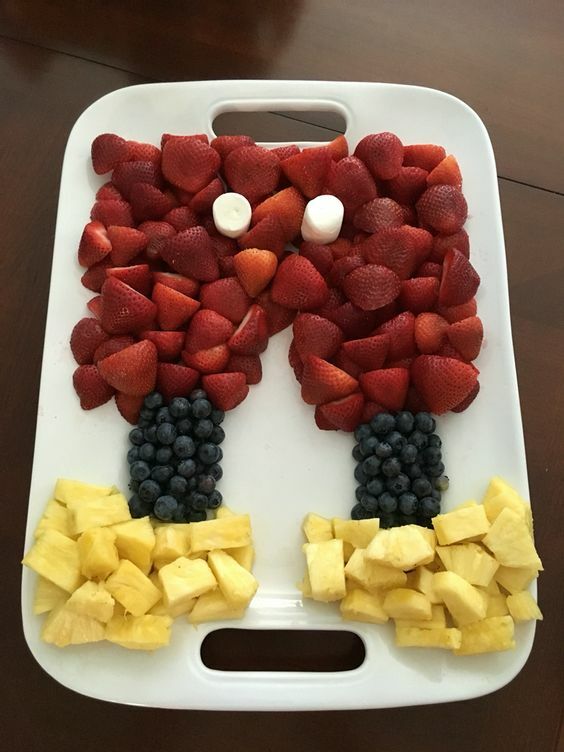 All you need are some pineapples, blueberries and strawberries to make the bottom half of Mickey. Then add two marshmallows to the top. This fruit tray idea will definitely have you winning party mom of the year! 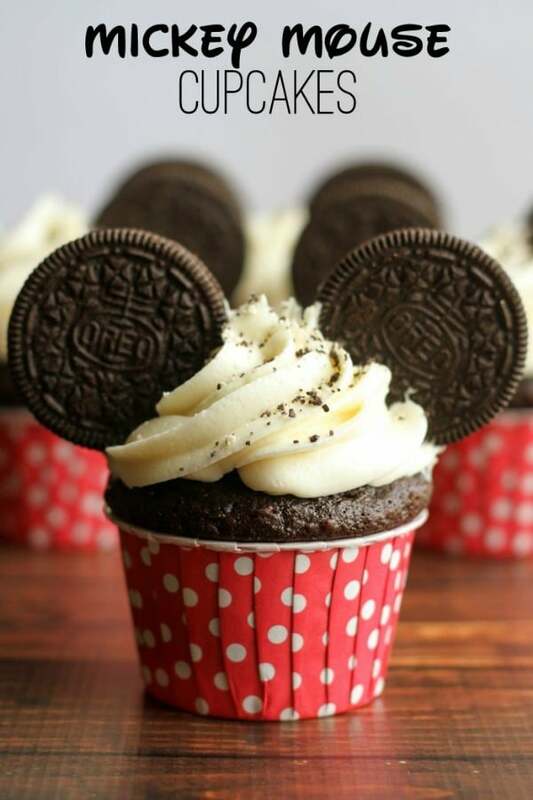 Any mom can whip up these delicious and Easy Mickey Mouse Cupcakes. Don’t forget to add two Oreo cookies for the ears. Don’t they just look darling in those red and white polka dot cupcake cups?! What an easy way to add to this fun birthday party theme. 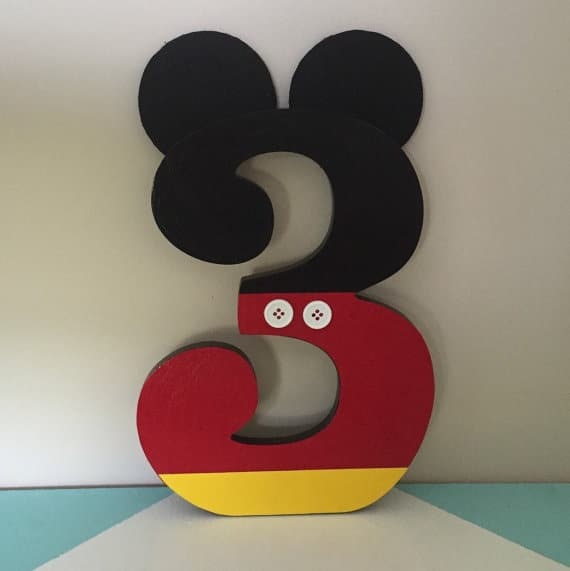 Your kid’s birthday party will be a hit with this Mickey Mouse Instagram Inspired Photo Frame. The kids will have a blast taking photo booth type pictures with their friends! 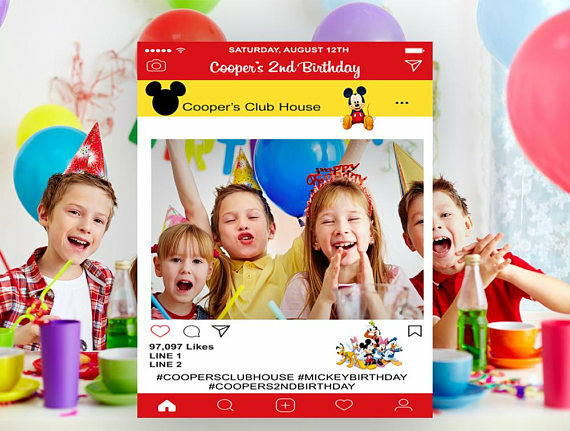 Customize the Instagram frame with your child’s name, date, and some super cool party hashtags! 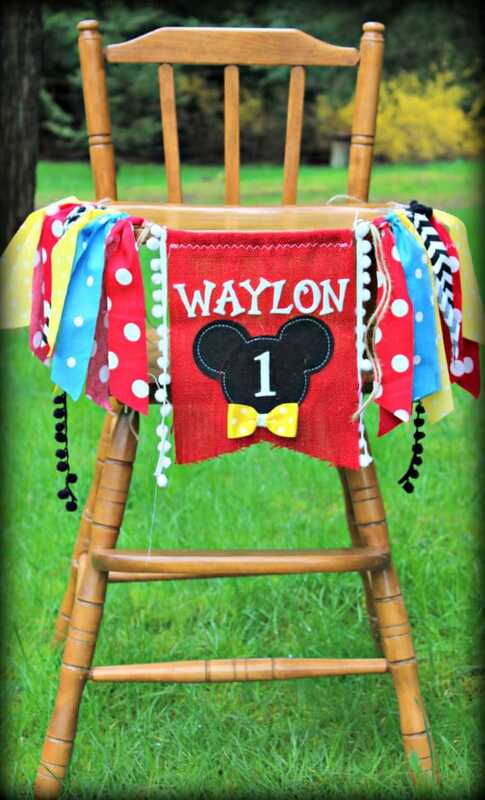 Mickey Mouse is a popular theme for a first birthday, so if you’re planning a Mickey first birthday you need this fab Mickey Mouse High Chair Banner. Your little cutie will look adorable sitting in their decorated highchair. Imagine the photo ops with this decoration! LOVE! 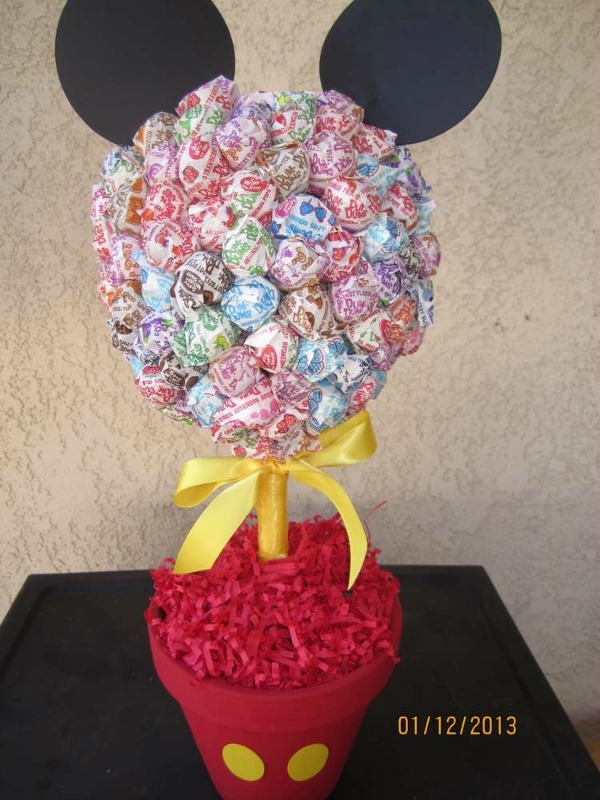 Imagine how cool it would be if you had a Mickey Mouse DIY Lollipop Topiary as a table centerpiece for each of your party tables?! Here’s a similar tutorial that shows you how to make your own. You can even give them to winners of your party games at the end of the party. Any child would love winning one of these to take home! 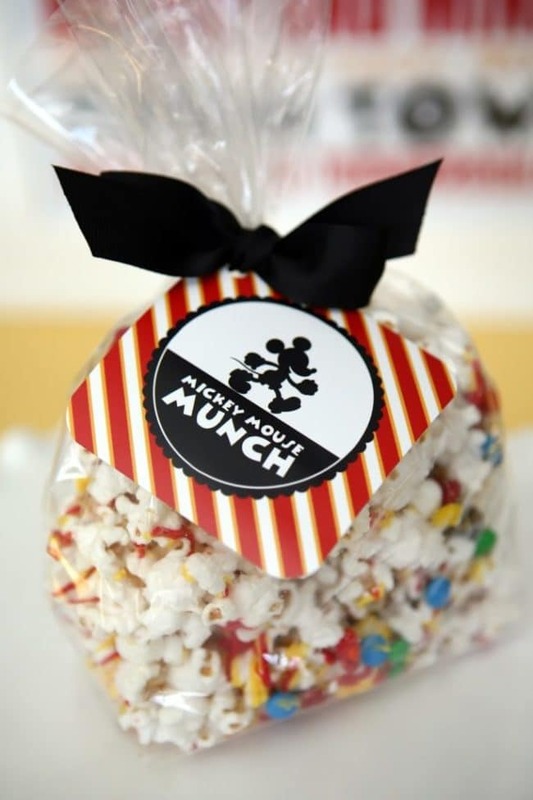 Bring a piece of Disneyland to your birthday party with these Mickey Mouse Shaped Rice Krispie Favors. You can use them as party favors or as an additional party dessert. Topped with M&Ms and drizzled with chocolate, these treats will be a party favorite. Add them to your dessert table along with your cupcakes, cake, cookies and more! 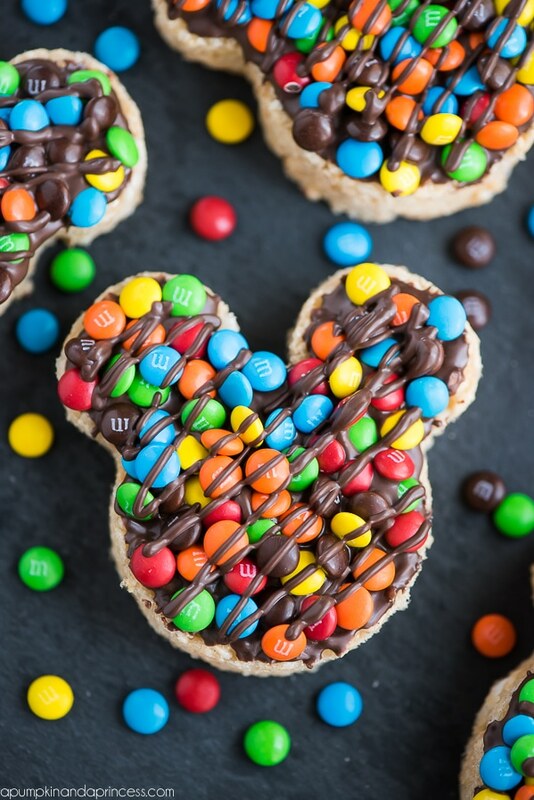 There are so many fun Mickey Mouse treats you can make for this popular theme! 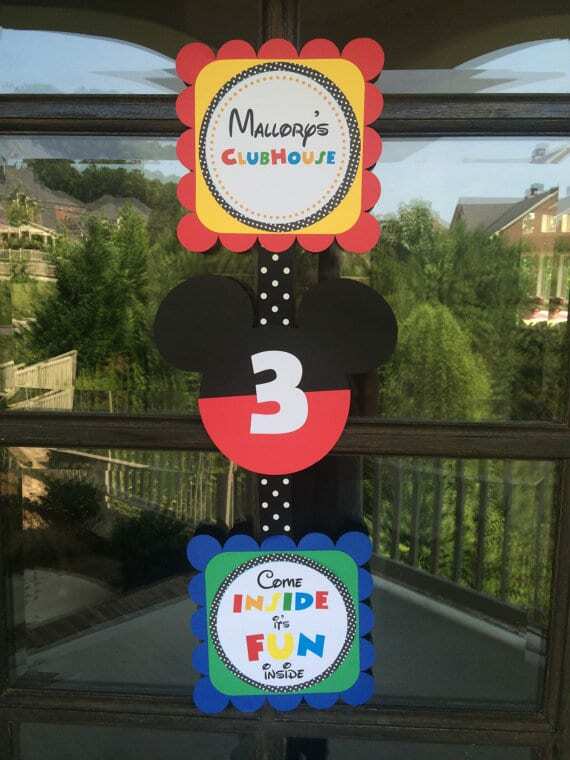 If you’re looking for fun Mickey decorations for your party, you have to check out this Mickey Mouse Number Party Decor. Get a number done for any age and place this decoration at the dessert table or gift table for a cute Mickey-themed decoration. You can even personalized it by putting the birthday girl or boy’s name on it too! What a fun idea! The fun part about planning parties is getting your craft on, right?! So get your your glue gun out because these DIY Mickey Mouse Party Centerpieces are fabulous! Dress up your party table with these centerpieces and have your party stand out! Here’s a similar tutorial to get you started. With some Styrofoam balls, paint and a red bucket, you can whip these up in no time! 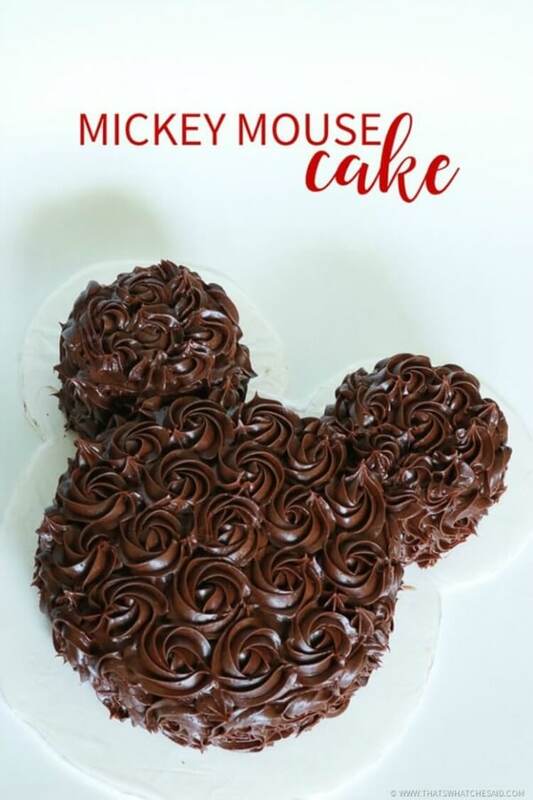 This Chocolate Mickey Mouse Cake is sure to be a hit with your guests! Who doesn’t love chocolate, right?! This cake is perfect for any birthday party and would make a great centerpiece on your sweets table. This cake features beautiful chocolate icing rosettes. Doesn’t that chocolate frosting look decadent?! Don’t expect any leftovers from this Mickey Mouse birthday cake! Put on your ears it’s time for cheers! It’s time to put on some mouse ears with this Mickey Mouse Ears Station. This idea is pretty much a must-have for any Mickey party. Make sure to include Minnie Mouse ears for the girls too! We love the DIY sign. What a great idea for a children’s Disney themed party. I don’t know about you, but I LOVE those chalkboard signs that have all the details about the birthday boy or girl. 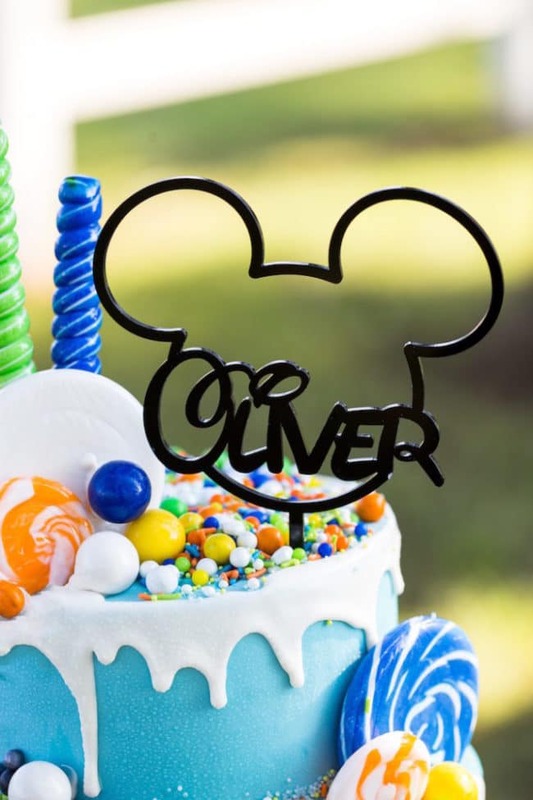 This Mickey Chalkboard Birthday Sign is a must for a first birthday party or any age really. Don’t forget to have the birthday boy or girl take a photo with their customized chalkboard sign! Ok, so let’s talk more about the birthday cake. The cake is the centerpiece of your dessert table, so a great design is always the way to go. 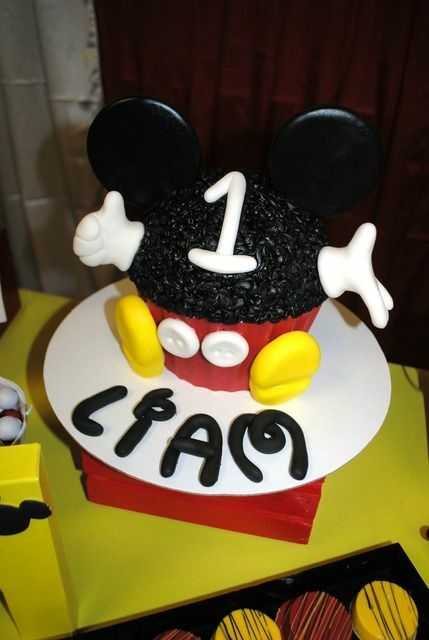 We are loving the design of this fabulous Mickey Birthday Cake. This cake on your table will definitely be the topic of conversation at your party. Everyone will love it, especially the guest of honor! Another fun, budget-friendly craft for your party are these easy DIY Mickey Mouse Party Plates. All you need is your hot glue gun, some glue, scissors, black paper plates from the Dollar Store, and some black construction paper. It’s that easy to have some fun with this party on a budget! Come inside it’s fun inside! Welcome your guests as they enter your event with this cute Mickey Mouse Welcome Door Sign. The sign features the birthday boy or girl’s name. It’s little details like this that leave a lasting impact! 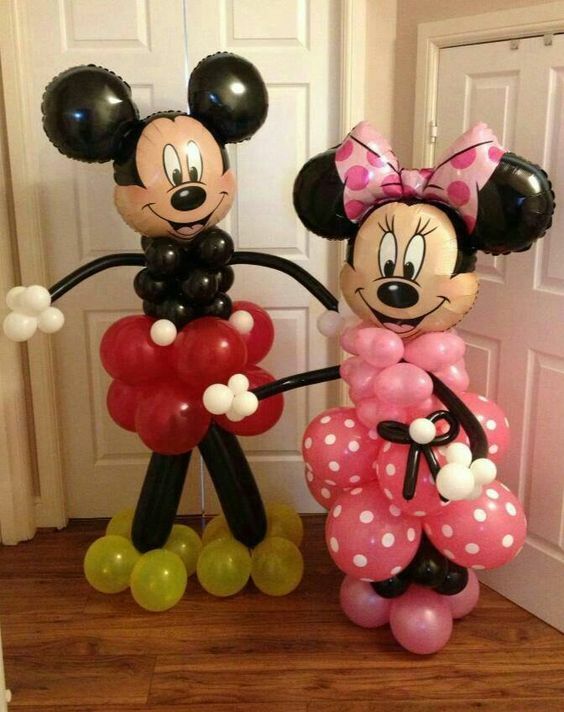 A Mickey Mouse birthday definitely calls for some Lifesize Mickey and Minnie Balloon Decor! Imagine the children’s faces light up when they see these balloon party decorations! Place them on each side of your dessert table or gift table! They also make a good photo opp too! If you’ve been reading this blog for a while now you know that we LOVE dessert tables. We love how creative people get with their themes and desserts tables too! This theme is so much fun because you can get super creative with the food, desserts and decor. Here’s a super cool Mickey Mouse Dessert Table idea for your child’s birthday party that we’re totally loving. How awesome is the backdrop?! We also love the mix of polka dots and stripes. 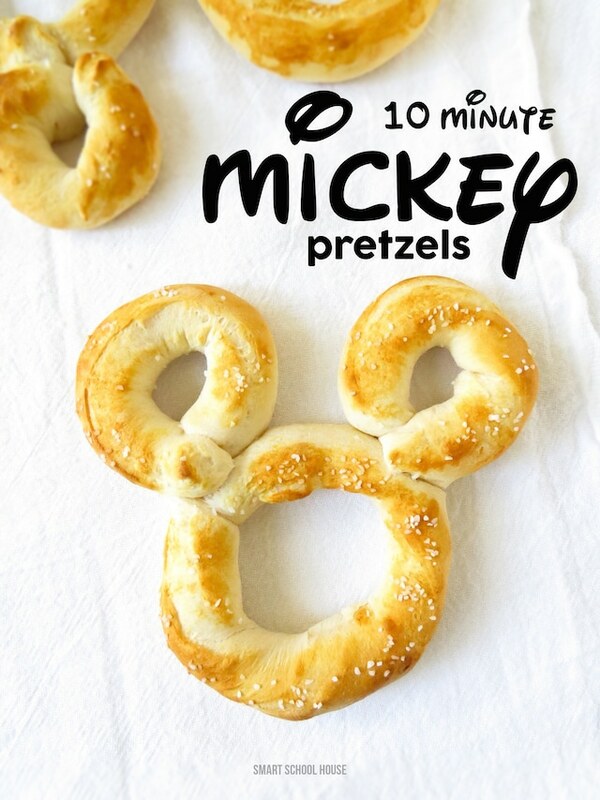 These Mickey Mouse Soft Pretzels look absolutely delicious and take only 10 minutes to make! So not only are they quick and easy, but they will be a hit with the kids! Also be sure to check out these 5-Minute Mickey Biscuits that you can also add to your party food menu. 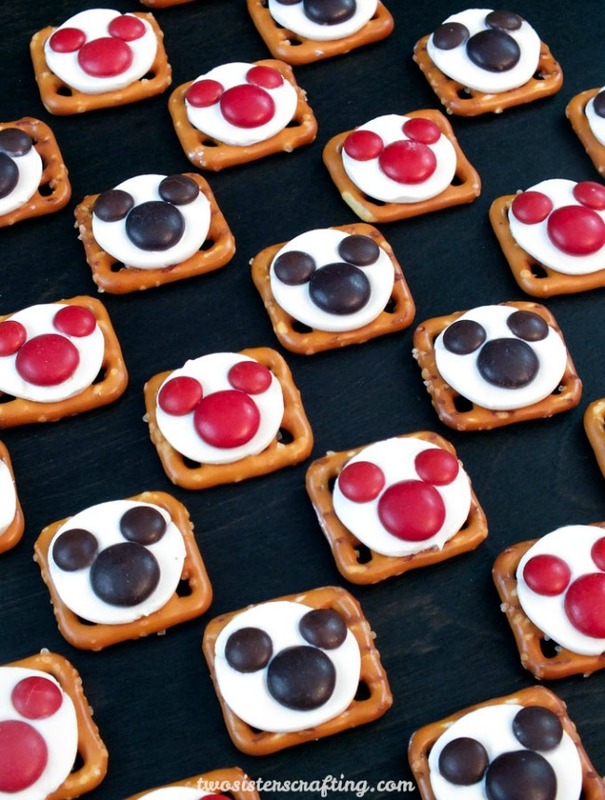 You can’t go wrong with these Mickey Mouse Pretzel Bites on your dessert table. The salty and sweet combination of this party snack is what makes this one of our favorites! Oh and they are really cute too! Are you looking for more easy Mickey Mouse snacks? Check out these super simple snack cakes on a stick! 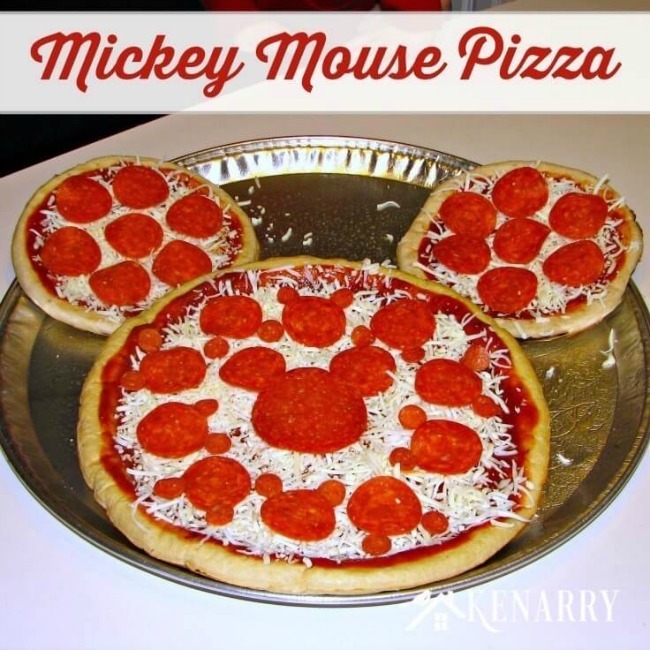 Everything from your desserts to your party food will scream MICKEY with this Mickey Mouse Pizza! Not only is the pizza shaped like him but look at the pepperoni! What a clever food idea for a party. Some other great food ideas for a Mickey and Friends party are “Minnie” mini pizzas, hot dog hot diggity dogs, Minnie’s bow tie salad, Clarabelle’s cheese puffs, Mickey shaped sandwiches, Pluto punch, Goofy’s grapes, Chips and Dale, Goofy’s garden veggies, Toodles Noodles, and Clubhouse chicken nuggets!!! 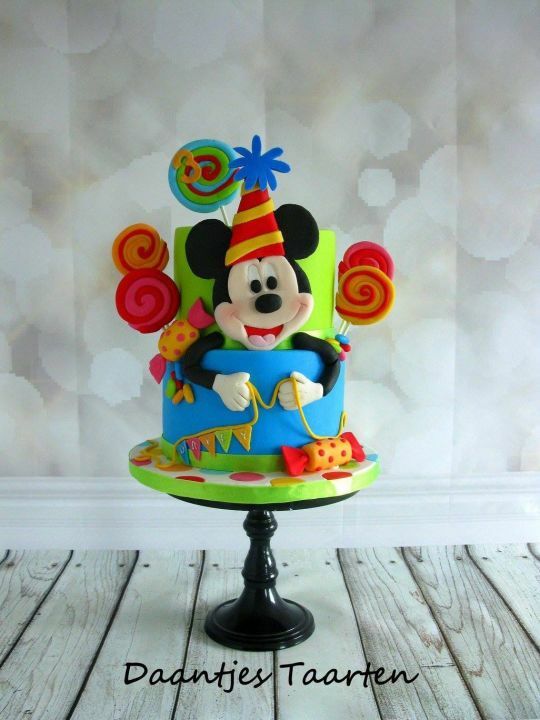 This Colorful Candy Themed Mickey Birthday Cake is absolutely adorable. How cool would it be to have a super colorful party for this theme?! 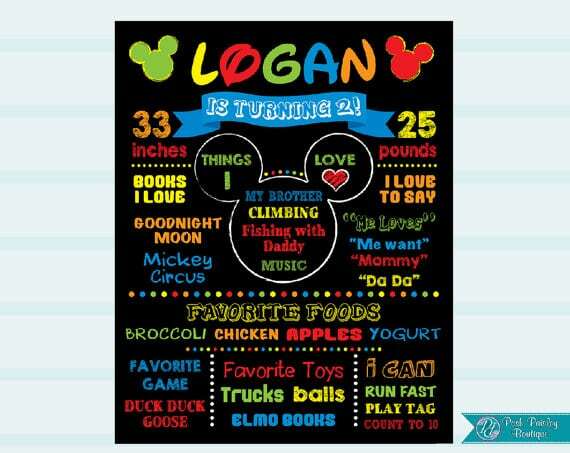 Grab some fun and colorful free printables for your colorful Disney-inspired birthday bash. If you’re looking for the perfect first birthday smash cake than look no further! This adorable Mickey Mouse Smash Cake is just the thing your little one will want to dive into on his or her first birthday. Imagine those cute birthday photos! 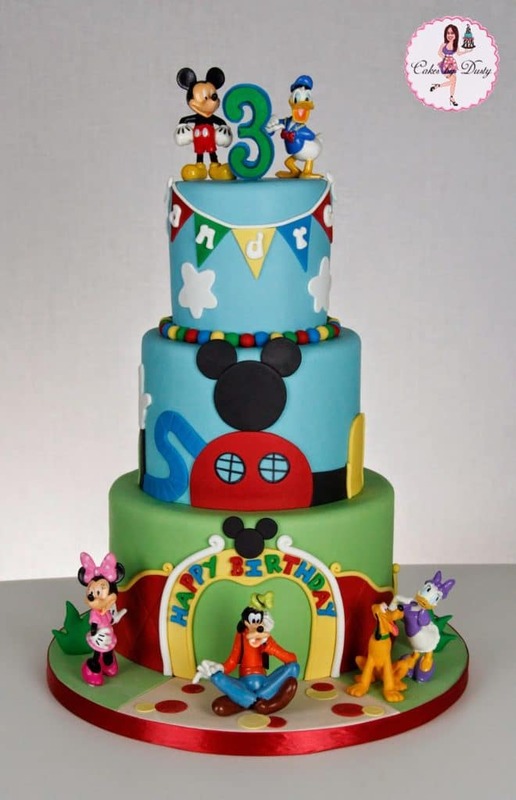 This three-tiered Mickey Mouse Clubhouse Cake features all of the adorable Disney characters! Colorful and designed to perfection, this cake will definitely stand out at your party. If you’re having a lot of guests, this cake is perfect! 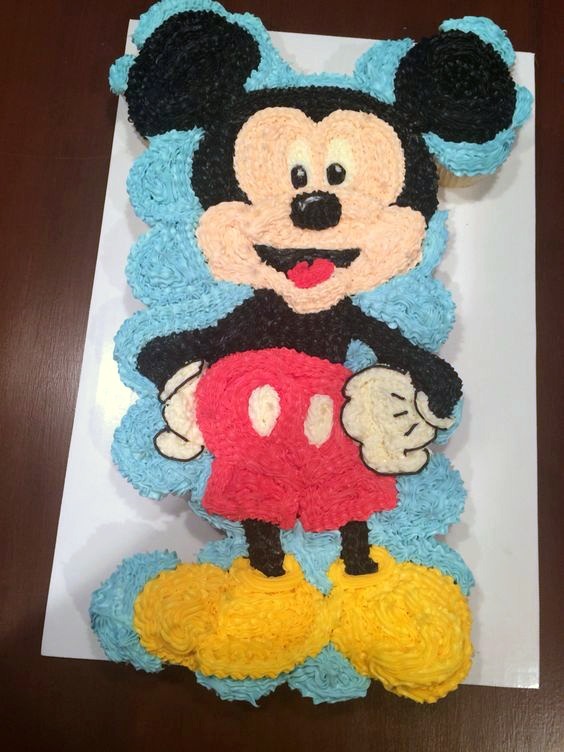 What do you think about this Mickey Mouse Clubhouse cake? 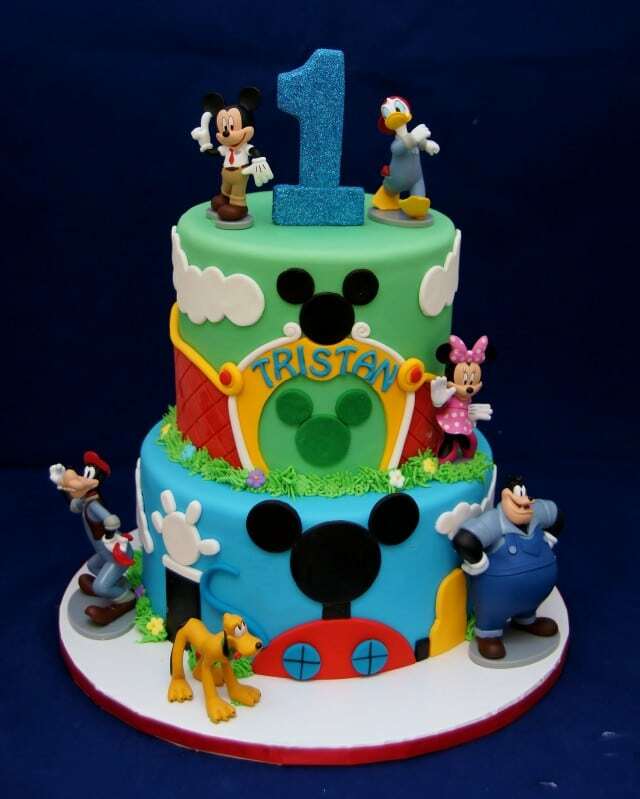 Celebrate your party with this fun and fabulous Mickey Mouse Clubhouse Cake. This cake is another great design that features all of the lovable characters. With three tiers and a blue glitter number 1 topper, this cake is one of our favorites. The birthday boy definitely needs to dress the part for his party or cake smash photo shoot. 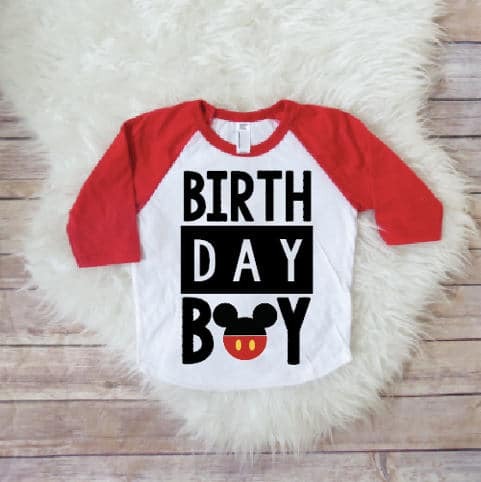 This Mickey Mouse Birthday Shirt is the perfect birthday outfit. And we can’t forget about the birthday girls! Here’s a cute shirt for them. 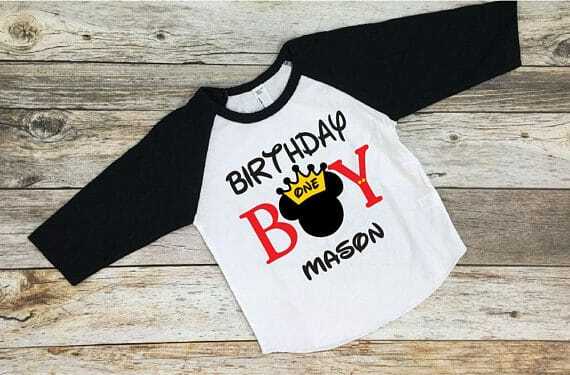 If your child is turning 1, here’s another cute First Birthday Mickey Shirt that your little one can wear on their special day. And for the girls, here’s an adorable Minnie birthday shirt! 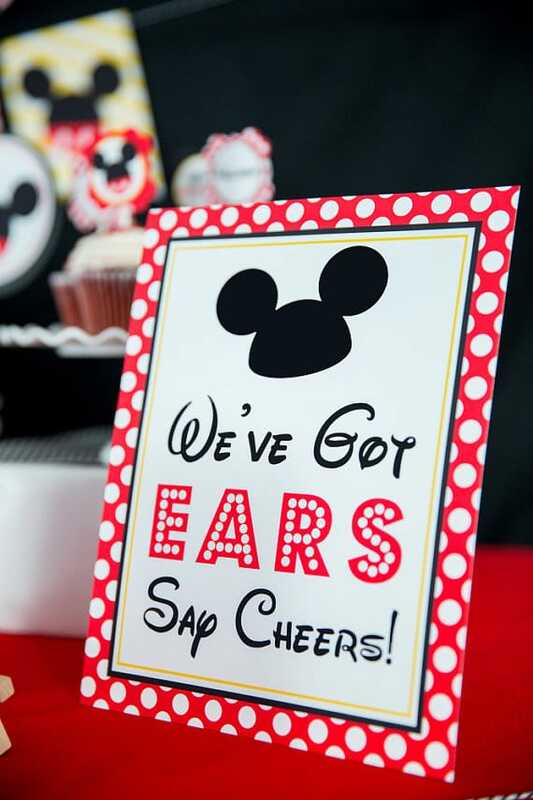 This Mickey Mouse Ears Sign is perfect for your ears station! 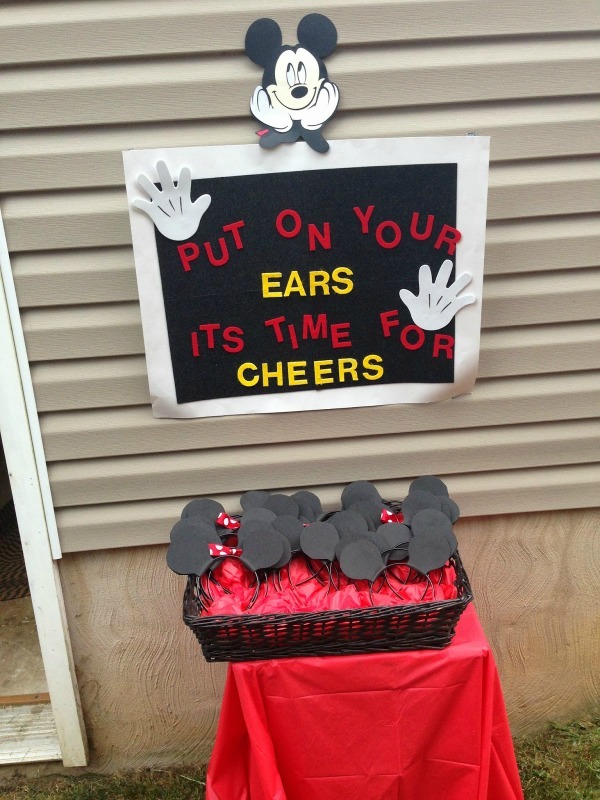 Have your station set up with Mickey and Minnie ears for the children to wear around the party. They also double as a party favor! 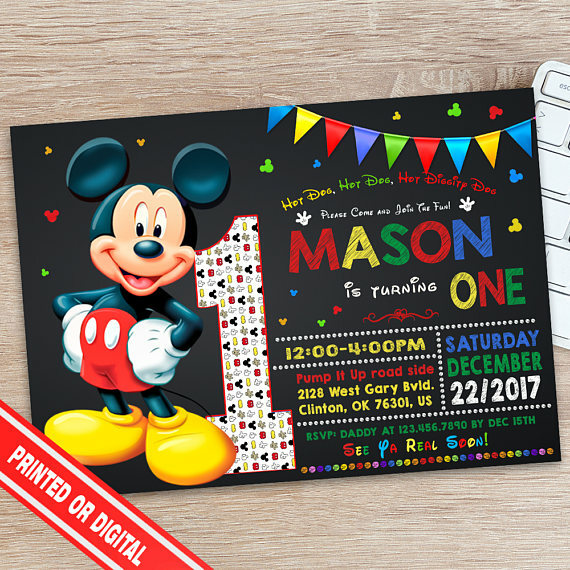 If you’re ready to invite your guests for some Disney fun, this Mickey Mouse Birthday Party Invitation is perfect! The invitation is the introduction to your party and theme and guests will be so excited to get this invite! If you’re totally loving the drip cake trend like we are, then this next cake is for you! 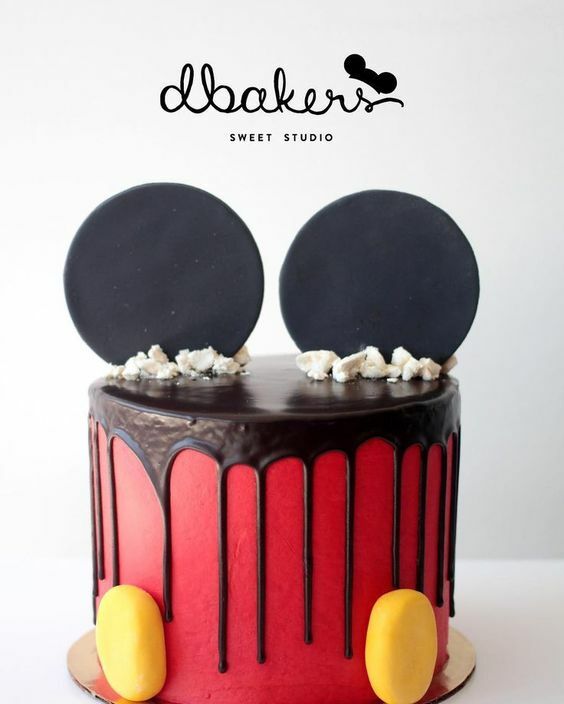 This Mickey Mouse Drip Cake is AH-MAZING! This would look great at any Mickey Mouse themed party. Ok, we all know kids love cupcakes so this Mickey Cupcake Cake at your celebration will be a total hit! Whether you’re having a big birthday bash or a school gathering with your classmates, this cupcake cake is perfect to celebrate a special birthday! 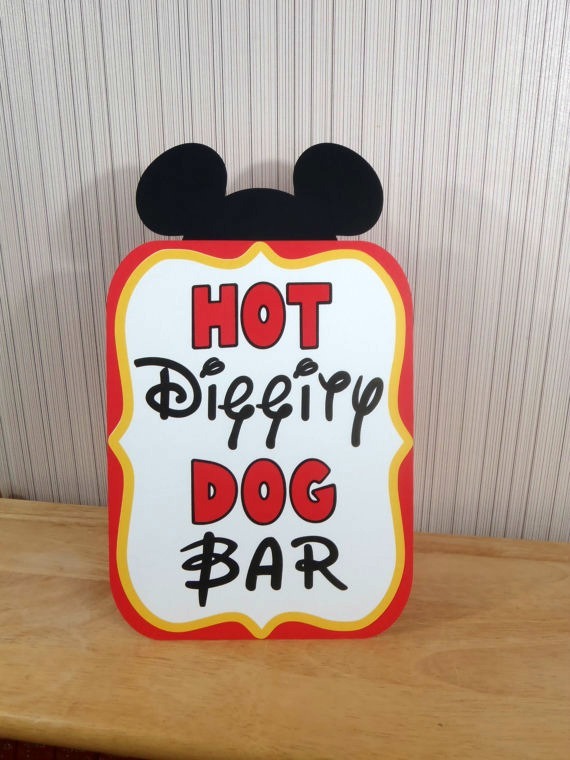 Now if you’re having a Mickey party then you definitely need a Hot Diggity Dog Bar, right?! Set up an awesome hot dog bar with a variety of toppings and add this Mickey Hot Dog Bar Sign. Your guests will love this idea! I mean who wouldn’t love a hot dog bar at their party?! 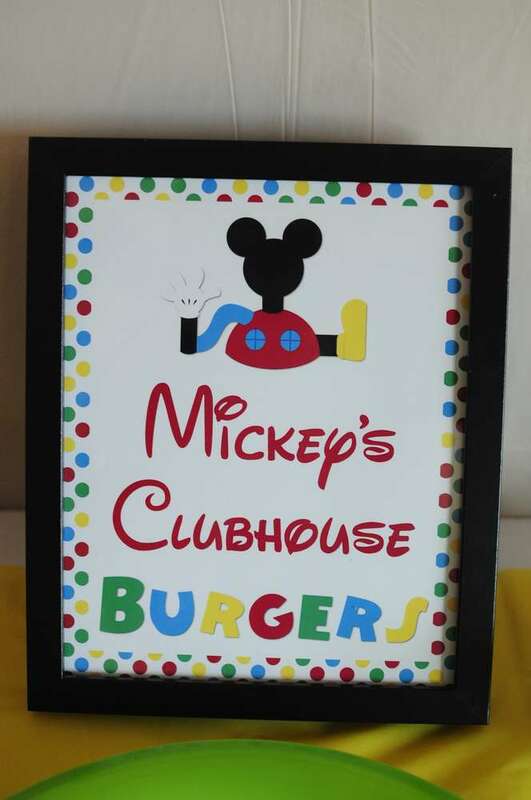 If you’re going to have a hot dog bar you might as well have some Mickey’s Clubhouse Burgers! You definitely can’t go wrong with those items on your party menu! 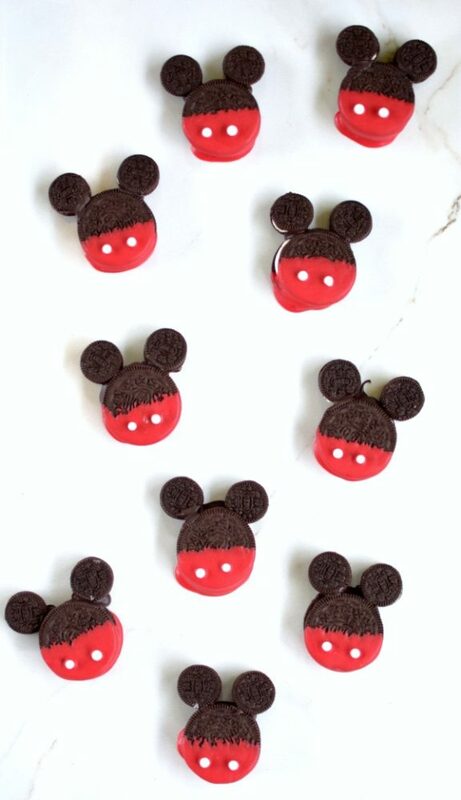 Another great party favor idea are these Mickey Mouse Munch Party Favors. You will love this mix of popcorn, M&Ms and chocolate candy melts … YUM! Add a cute favor tag like this one and your guests will leave your event happy. 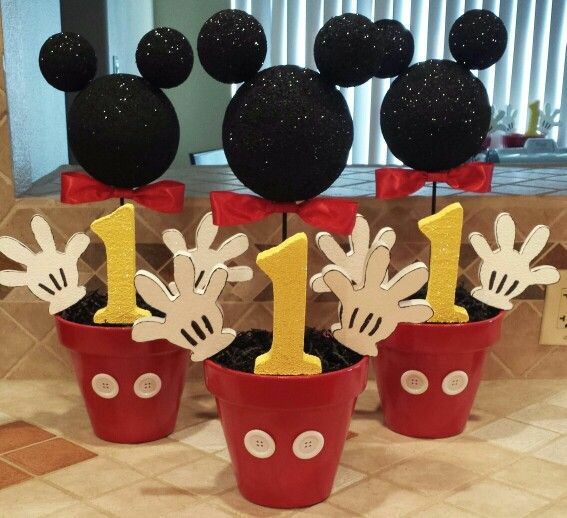 We love these Mickey Party Decorations! Coordinating streamers hang across the ceiling with a DIY Mickey Lantern in the center. This decor idea is budget-friendly but makes a big impact! 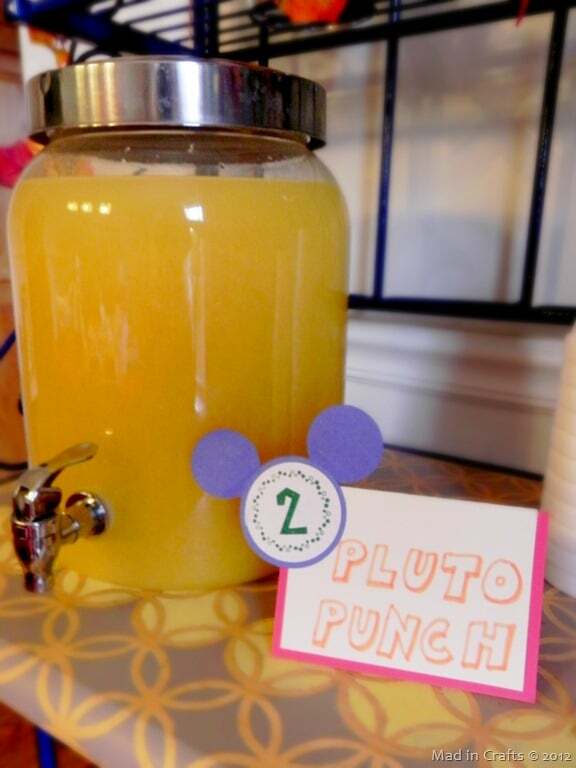 Wash down all of those Mickey-themed sweets and treats with some Pluto Punch! Adding clever names to your party food and drinks is always a fun idea for any party theme! Always save the best for last, right?! This Custom Mickey Mouse Cake Topper is our favorite Mickey detail. It’s definitely a must-have for this Disney party theme! Keen to have a Mickey Mouse party? 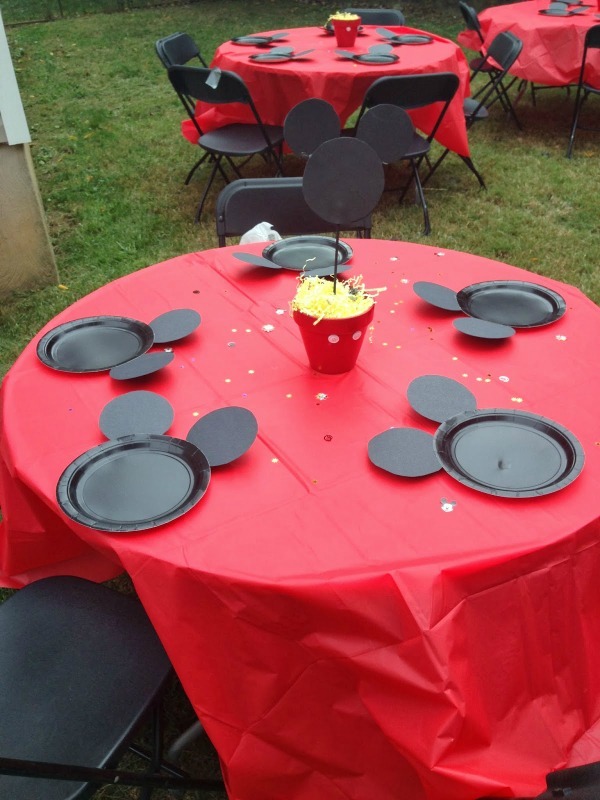 These ideas will make your Mickey Mouse party theme stand out from the rest. What birthday party ideas did you bookmark? Do you have some favorite Mickey Mouse Party Ideas that you want us to include in this list? Feel free to share them and let us know in the comments below!